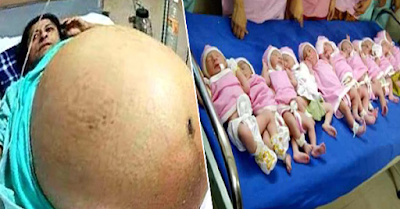 VIRAL: Woman Gives Birth to Eleven Babies at Once! Truth Revealed! In the year 2012, it was reported that a Pakistani woman aged 25 years gave birth to eleven healthy children at the same time. It was reported that she delivered the eleven children in a hospital in Surat on February 6, 2012. Her pictures as well as her children’s photos were very popular and widely circulated in the social media. They were even called ‘Eleventh Wonder of the World’. In such cases, the babies have mostly died within a few minutes after their birth. But in this case all were born healthy and alive. The doctors and nurses were amazed to see the wonder before them. Are you swayed by the story? Don’t be, because this is nothing more than a hoax. It was just a false story being spread by some infamous people on social media for their enjoyment. They knew how to handle images and turn it into an interesting story. 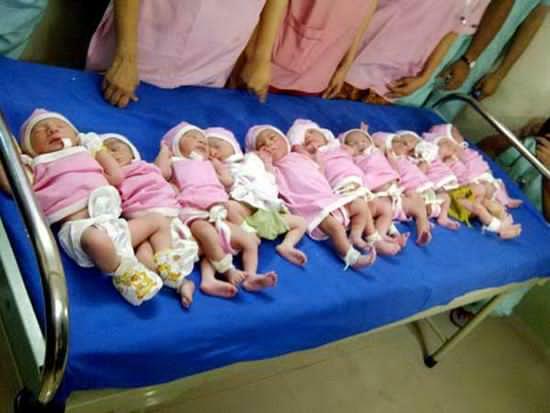 For the true story, the picture of 11 babies lying together with a team of doctors is the real pic. This picture is actually taken from a hospital named Nadkarni’s 21st Century Hospital & Test Tube Baby Centre in Surat. The picture was taken when eleven baby boys were born on 11 November 2011 i.e. 11/11/11, which is quite an amazing coincidence. And for the record these babies were born to different mothers and not just one. If you want a spell to win the lottery, look no further. Dr. Ken lottery spell is amongst the most powerful spells I have expirence, and you will feel the power once He is done with your lottery spell. The spell uses a wide range of magical sources, then combines and funnels those energies into one single "beam" of luck attracting, destiny controlling, wealth manifesting pure magical power. Incorporating herbs, candles, the elements and much more simple magical techniques, this spell can be cast in a few minutes using a few very simple ingredients in His temple. I am a living witness of his power because he just help me with his lottery spell and i won a huge amount of money, thanks to you Dr. Ken. Contact him for help through his emaill: supersolutionhome1@gmail.com or supersolutionhom@yahoo.com or through his number +2348074433380. Whatever the type of lottery you play you can use this lottery spell, to help you win. if you need help on how to win on lottery hastily contact DR. KEN for help now. emaill: supersolutionhome1@gmail.com or supersolutionhom@yahoo.com or through his number +2348074433380. Finding a dentist is something people dread but it is essential. Factors such as such as attitude, education, work ethics and location must be considered.